Ultrasounds don’t hurt a bit, but the gooey gel they use during the procedure can be cold, sticky and really, really messy. So why in the world would they use it and can you do without it? Why is Ultrasound gel used? Ultrasound waves don’t travel very well through air. So any little bit of air that would be between the probe and the skin would be a problem. And dry skin poses a lot of tiny pockets of air. Ultrasound gel is a type of conductive medium that enables a tight bond between the skin and the probe or transducer, letting the waves transmit directly to the tissues beneath and to the parts that need to be imaged. It is formulated to act as a coupling agent and reduce static. In fact, the more gel, the better – thus why many radiologists giving the exam pile it on. Besides ultrasounds themselves, the gel is also used with a fetal Doppler, which can be employed to allow parents and doctors to listen to the heart beat of an unborn child. Ultrasonic gel is usually composed of propylene glycol, water and occasionally a dye. The dye is more for looks than making it work better. It is usually clear and thick, and a little bit sticky. That way, when it is applied to the skin it doesn’t drip or run off. At the end of the procedure it can be wiped off easily. So why does it always seem so cold? (That’s the most common complaint) Well it doesn’t have to be. Many medical facilities use special warmers to make their gel a more comfortable temperature before applying it. Ask for that before you go – most good places should have no problem providing that request. Above: Using ultrasound gel on a patient's knee. 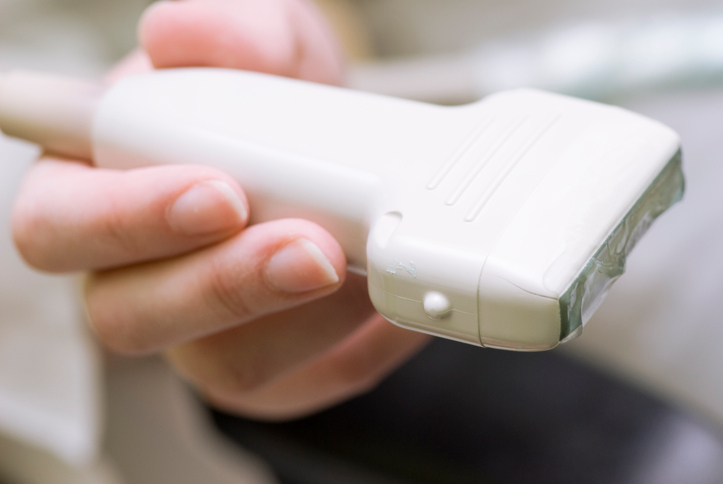 Above: The size and shape of an ultrasound conductor may change, but they all use gel. Above: Even during ultrasound therapy, the gel needs to be used.